Cat owners, how much do you hate the litter box? We all know it is a necessary evil when it comes to owning cats, but it doesn’t mean we have to like that it’s messy, stinky, and in many cases, just plain gross. I will freely admit, I spent quite a bit of time jumping litter brands with our kitties. It seemed that none of them were great at controlling odor, and those that did the best job were usually quite messy to clean up. Personally, I can’t stand clay litter, not just because of the dust and mess, but how horrible it is for the environment. Normal, everyday clay litter comes from strip mining, which destroys natural habitat for animals, not to mention beautiful forests and mountains. As well, it is treated with many chemicals that aren’t safe for us or our cats to breathe. In other words, it can be bad news for everyone all around. 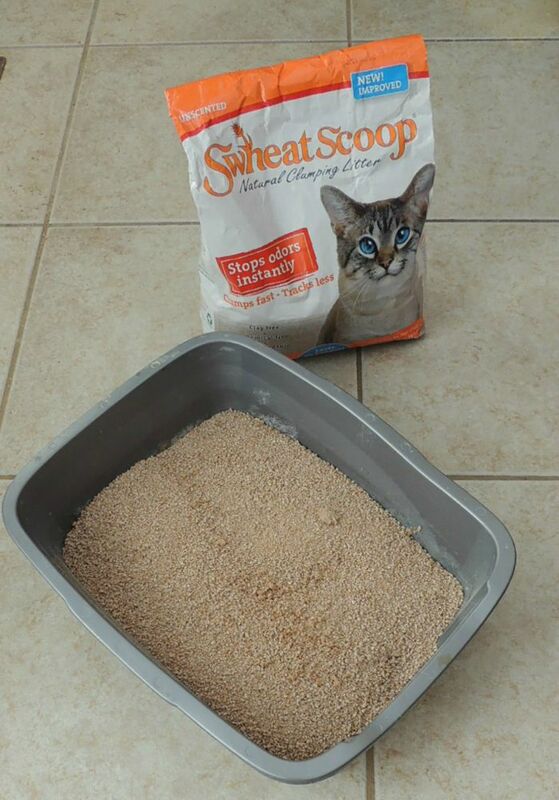 Luckily, my husband and I recently found the perfect solution for our family’s cats – sWheat Scoop! sWheat Scoop: What is It? Looking for a high quality, all natural litter that is perfect for every cat? If so, we think you will love sWheat Scoop! This all natural, clay-free litter is not only free of harmful chemicals, but is made from 100% wheat and grain. As well, it is 100% biodegradable and renewable. In other words, you will have eco-friendly, clumping litter without the mess of clay, that is fantastic at keeping down those unpleasant smells from the litter box. To learn more, watch the video below about sWheat Scoop! Overall, we are fairly impressed with this litter. From what we have seen, it is much cleaner than traditional litter, but clumps well like the litter we all know. Also, it controls the scent fairly well, something impressive when you have multiple cats using the same litter box. While it is too soon to tell, we are also hoping it may help with some of the allergy issues – unfortunately for our family’s cats, Lucie isn’t the only one with my inlaws who is suffering from severe allergies. Her half sister, PB, also suffers from the same mysterious allergies no one can figure out. Our hope is that with the new litter, it can improve their quality of life and maybe their allergies are something no one had ever considered – their litter. Really, I have to say that sWheat Scoop has been the best clay litter alternative I have seen yet, and I cannot image going back to clay or crystal litter for Lucie. Based on our own experience (and the experience with the other cats living with my inlaws), we are happy to give sWheat Scoop an A rating! Want to purchase this awesome litter for your own cat? 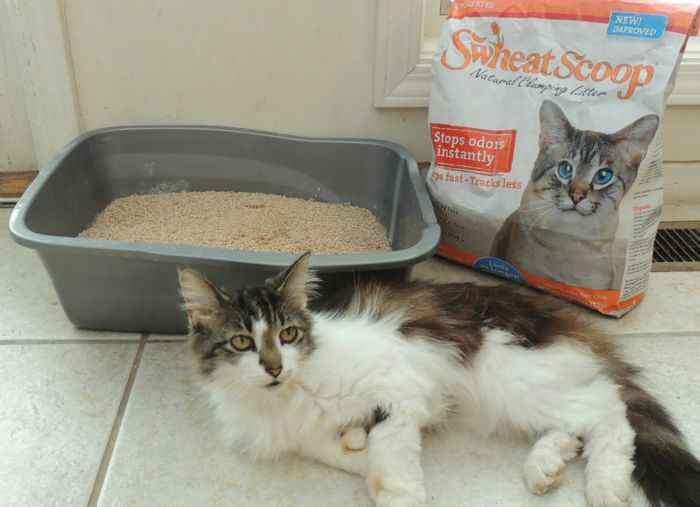 You can buy sWheat Scoop in original or multi-cat at Petsmart, Petco, or a pet store near you using their store locator. We are certain that once you try this awesome litter, you will understand why people all over the world love SWheet Scoop litter! Want to learn more? Check out sWheat Scoop on Social Media! I love the idea of using more natural litter. Does it track all over the house? y litter.I bet this cuts down on the dust that cats breath from clay litter. I’m quite leery of changing cat litter for I’ve tried most brands and off brands. Gotta stick to my Fresh step multi cat. I love the idea, but I prefer litter that clumps, it’s just easier to clean. I have tried every litter that I can find, and my cat doesn’t like anything but Tidy Cats. I’ve never heard of this litter, so I might give it a shot to see if my picky girl will like it. I love the clumping litter too much to switch, but that is a beautiful cat! Looks real interesting.Would like to try it! We are getting ready to get a kitten! This is great info for me. Thanks! I would love to try this for my 3 cats, so much better for them than cat litters that are full of chemicals! Haven’t tried it yet but love the fact that it’s all natural. No tracking dust all over the house and cat’s nor us have to smell all the dust that’s usually stirred up. I like that it’s eco friendly! That it clumps too is even better!! This sounds like the litter I have been looking for..for my picky kitty. I like the natural clay with wheat litter..That it stops odors instantly. And, the fact it is biodegradable. Finally and most important no harmful chemicals for by baby. I find this intriguing. I love that it’s natural! I will be checking this out! We have been using clay litter for our cat and it has so much dust that it makes my cat sneeze. 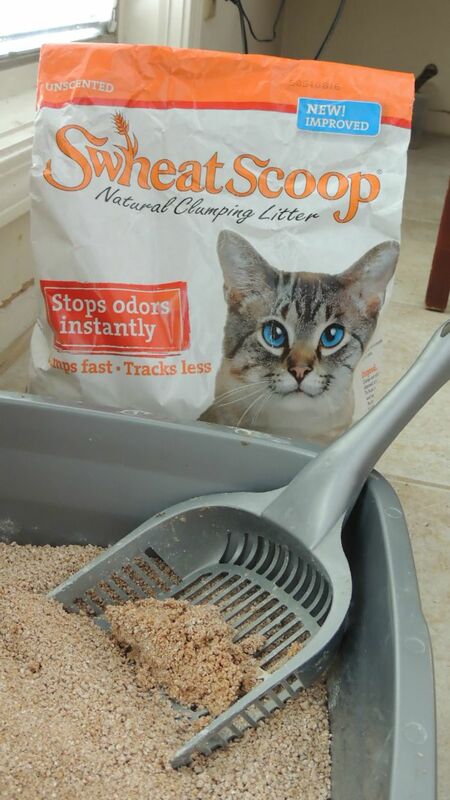 This is the first time I’m hearing about SWheat Scoop litter and I like that it says that it stops odor instantly. I like the fact that it is all natural and biodegradable. This will be great for my youngest son and his family to try. I really look forward to trying out a safe and natural litter. I don’t like the dusty and chemically laced regular store brands at all. They scare me. I have 5 cats and 4 litter boxes it is almost like a full time job keeping them cleaned. I have used Swheat scoop before and I really liked it the only issue I had with it was they tracked it everywhere. I still buy it on occasion. I most like that it is biodegradable. I m curious as to the clumping and odor control power and how it compares to my current brand. I would love for my four cats to try. One cat is a 20 pounder very tall and big with really big puddles been wanting to try the wheat some litter doesnt help with smell. I’ve seen this litter in the stores and wanted to try it, I just haven’t yet. It sounds very promising, two of my seven kitties have respiratory issues so this might be great for them. I’m glad it’s good for the environment too, that’s important to me. I absolutely cannot stand clay litter either! Good luck with your kitties and thanks for all the valuable information. We won’t use clay litter at all because it isn’t good for cats. We try every kind that isn’t clay. Walnut made my bedspread and floors black. We are looking for another kind because the dust free one we’re using now has lots of dust. I’d love to win this so we could try this. I hadn’t heard of this product before; it sounds like an excellent cat litter to use. I especially like that it’s all natural and doesn’t have harmful chemicals. Thanks for posting! This looks like a very interesting litter (as far as litter goes)! I hate all the dust that the kitty litter creates. Not only is it not good for me, but I hate to think how much my cats inhale! Thanks for posting the “clumped” picture of the sWheat litter. I was glad to see that it clumps as well as the one I use. I hate the dust that gets all in the air with the clay litter we currently use, but I like how well it clumps. I will have to give this a try and see how well it clumps and how well the boys like using it. One in particular can be pretty picky about what kind of litter he will use. wow that sound so cool so tired of the dust in the cat litter. I like this natural clumping litter that does not contain clay. That must mean that it is biodegradable. I have heard good things about sWheat Scoop so I want to try it. It is supposed to keep odors down, its safe for my cats, it’s scoopable liter and it’s good for the environment. Best of all, it’s made from natural products unlike many of the cat liters currently available. I have two elderly cats, so I’m very concerned about their cat litter. I have heard of this product recently, good reviews on this. I am eager to try this litter. I am trying to make our home healthier for our family. Traditional litter contains chemicals that may be harmful for us to breathe and sWheat Scoop sounds like a good alternative for us to try. Definitely different than the other clumping litter that I have always used. I would definitely try odor would be a concern as well as tracking out of box.. My cats acceptance of the new material. all and all I think it could be a great new product. Price comparison would be important too. What is odd Walmart now has a litter made from corn!Wonder how it was treated to make it clump? Dust from clay litter is nasty. I currently use World’s Best Litter and love it but I would like to try this brand to see how it compares. I would really love to try this litter. I, also, have tried many different brands and have never found one that I am truly satified with. Cleaning the litterbox is a thankless job but I love my kitties!! It is a neccessary evil. Sounds like a great litter. Would much rather use a natural litter vs. clay for my babies and I’ll bet it feels better under their paws than clay too. This sounds great! I rescue cats and have up to 10 at a time till we find forever homes for them. I hate the clay and would love to find a different product. This sound like a great alternative and I shall mention it to ,y son and daughterinlaw. however, the final decision is up,to the cats! I like that it clumps easy and eliminates the odors. I just tried a new brand and it did nothing to help the odor. I was scooping the litter box 2 maybe 3 times a day. I just want something good that will work for me and the 2 kitties. This sounds like a good product. I am so glad that this one won’t cause problems from me or the cat breathing, So many other cat little I can not use because it causes too much dust.. I like that it controls the scent fairly well, something impressive when you have multiple cats using the same litter box. I have tried many alternatives to the clay litters and sWheat Scoop is by far my favorite. Thanks for the review! I love the clumping and the smell control. I would love to try it. I’m always scared to try new things but I would give this a go. I had noticed this at PetSmart but was hesitant to try it because I feel like so many litter producers stretch the truth when they point out the odor stopping abilities. After reading your review I am willing to give it a try and hopefully it won’t track as much dust out as out current brand. Thanks for keeping me informed! i’ll give anything a try. my cat is very picky about her litter. i would love to try this. we have 5 cats , and as many litter boxes and the clay litter is a disaster! 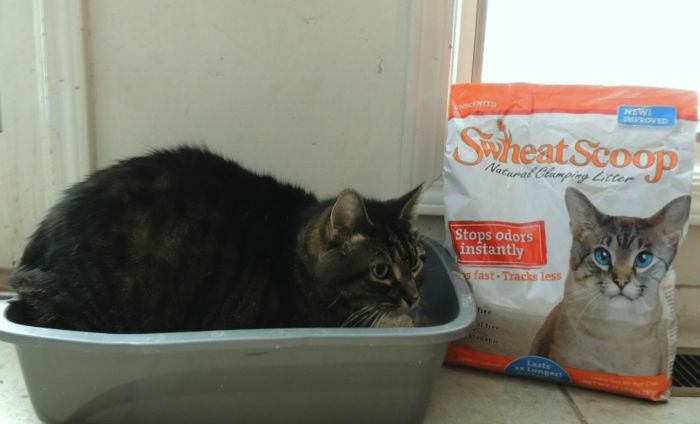 I love that this product is all natural, fast clumping, and will help with litter box odor. I also appreciate your honest review. It’s hard to find a good product that works but is safe for the fur babies. I have 3 cats so I feel you on the cat litter. My thing is I want a cat litter that holds up pretty well that I don’t have to frequently replace, thereby having to buy more cat litter. Once I scoop, I should still be able to use the remaining but some brands are better at that than others. I have used this litter for over 10 years because it is better for the environment than clay litter. However, they have recently changed the packaging from the paper bag you show to a plastic bag than contains less litter (same price). I think this is a large step backwards for this company and I will be shopping around for a better alternative! Interesting to me that they sent you the litter in the old package to review and yet your contest shows the new package. Disappointed in sWheat scoop! Lisa, this is the package they show on the website and our local PetSmart. Did they change it again?